Brian and I didn’t waste any time getting our sea legs back in motion. After many hugs, several kissed babes, and no goodbyes (because we aren’t dropping off the face of the planet for heavens’ sake!) we bid farewell to our beloved friends and paddled our dinghy out to reunite with Rode Trip. It had been a fabulous visit on land but the facts were that September would soon end and it was darn chilly in New England! Time to move south! We spent one night aboard Rode Trip re-settling; putting back into place our freshly laundered mattress cover, cushion covers, pillow cases, comforter, curtains and finding places for all our new provisions. The following morning we cast the lines off the mooring ball and sailed out of the Piscataqua River. We set sail without a predetermined destination, not typical for passage planning. The five day forecast predicted 10-15 knot northerlies and we figured we’d check the weather en-route and ride the northerlies as far south as we safely could. If the forecast changed dramatically we had designated bail out stops, Newport, RI and Cape May, NJ, where we could enter and anchor for protection. 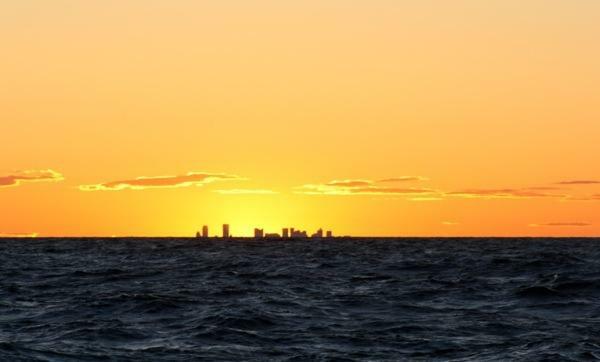 We were confident with this lack of a plan and said farewell to New England as the sun set behind the Boston skyline. The forecast held, although the wind did build to 15-20 knots with gusts of 25 knots (confirmed by our singing rigging). We continued onward with rolly, downwind sailing. Our biggest challenge was that our new main repeatedly broke the plastic track cars that Brian had installed. While underway, Brian sewed new track cars on three separate times and the fourth time when two more track cars snapped off we said, “That’s enough!” At 10:30pm that evening we changed out the new main for our old main and determined the new main would return once we had obtained metal track cars. We cruised along averaging four knots with a double reefed main and jib, no doubt due to our new provisions weighing us down…four days, 18 hours, and 518 nautical miles later we landed in Norfolk, VA. Talk about heading south in a hurry! Welcome back to Virginia from hurricane hole in Wilton Creek. Great to read you are on the move again. Hi! Have been following your blog. Any chance that you will stop on Oriental within the week? We are in here and would love to meet. Expect to be her until Oct 5-7 or so. Thanks for a warm welcome, Godwin! It’s fabulous to hear from you! Unfortunately, we’ve passed by Wilton Creek this year and thankfully haven’t yet encountered any hurricanes. But we are soaking in the history and scenery of the Dismal Swamp Canal and enjoying a bit of Virginia sunshine along the way. Lorraine, it is entirely possible that we’d arrive in Oriental within the week. I’ll keep you posted of our real time travel – we should be exiting the Dismal Swamp Canal tomorrow (Oct. 2) and we’ll see how far along we get! Would love to meet you also as I’ve enjoyed chatting with you through blog/email. We are in Myrtle Beach at Grand Dunes Marina…not sure of your plans for SC but if you happen to be in the ICW would love to say hi…and we have a car:) We will be back Oct 9 from our babysitting duties in Charlotte. Gary Naigle, 421 W Bute St #206, Norfolk, VA, 23510, United States. Greta Gustavson, 421 W Bute St #206, Norfolk, VA, 23510, United States. It is a perfect spot and the cost is only a bottle of whine for the person whose slip you are using. Gary and Greta live in a condo that has a dock/slip that comes with t he condo; but, many of the condo owners do not own boats. Thanks, Phyllis! At the moment our plans do not include SC as we’d like to jump from NC to the Bahamas end of October. We’ll keep you posted if anything changes. Scott, thanks for reminding me of that dock opportunity via OCC. We entered the Chesapeake on the final evening of our passage and navigated the Elizabeth River in darkness. We finally dropped the hook at 3:00am just off Hospital Point (technically Portsmouth, VA – across the river from Norfolk where the Nauticus is located). We are well on our way to our next destination but will keep other OCC connections in mind.